Originally in 2009, my relationship with Forever started by searching to find the best Aloe Vera in the industry. Already being an advocate of the Aloe Vera Plant and its natural healing properties, I found the company that would well represent this amazing plant in a consumable product. ​Soon after meeting Forever Living Products, I knew this is a valuable organization and one I would be proud to represent by learning they truly stood by their company's culture. Thereafter my introduction to Forever and discovering their value (and my own), I became an Independent Distributor with FLP. Initially my intentions were only to consume their aloe vera gel however due to my discovery of FLP's health benefits and by receiving the wholesale pricing for their products, I just had to share it with others. Over the years, I continued to recognize not only the health benefits of Forever's products but also the financial opportunity by simply sharing the Forever's proven marketing business structure. It had certainly become more clear to me that this company is based on a strong moral foundation with a smart marketing and business sense! For over 35 years, Forever maintained an absolutely significant, unique, profitable and credible establishment and one to be positively proud of. Recognizing all Forever's continued support and effectiveness of their marketing structure and culture, successful profits along with the TRUEST quality and greatest value of their products, it's a complete honor to be part of this organization! As mentioned, I had already been a big fan of the aloe vera plant and it's miraculous healing properties but I wasn't totally clear on all the amazing health benefits of Forever's Exclusive Aloe Vera Gel until I became much more knowledgeable by investigating and trying it myself. I had already learned how essential natural products are to our bodies and through my continuous holistic research, I found that most companies and their manufacturer's unfortunately modify "natural" ingredients. Hence, the discovery of FLP producing the highest potency of their patented aloe gel and all of their other amazing naturally sourced health and beauty products to which they really carefully cultivate, manufacture and produce, it was a total reality and I needed to be a part of it all! Quality products, a wonderful business culture and a successful structure, Forever has it all! This is all to say that within my initial introduction to Forever and my continued experience's as well as utilizing more of their products and further looking into the Forever's Aloe Vera, the company that best represented it, I found greater and greater results! Years later, I am grateful to be a member of this organization and feel certainly blessed to have found such an establishment and to be part of all! Physically consuming Forever's Aloe gel, I finally felt the way I wanted to feel, healthy, vibrant and energetic! I had been so longing for this type of natural alternative discovery as well as a business opportunity and developed Aloe Vitality to share it all with you! So there you have it for the short version of my Forever story. At the same time of discovering Forever's Aloe, I was exploring holistic treatments to treat IBS and Crohns disease. I was also working with an on-line marketing company out of Arizona (ironically Forever's headquarters also in Arizona) to develop an on-line e-commerce business. My first course was to find a niche business along with complimenting it with my passion. Well, the passion for "Aloe Vera" was more than obvious to me at that point hence I was completely inspired and it all started to unfold. I kept informing myself further and learned more about the Forever Living Products companies credibility and their business structure. It was then I realized that there is so much more potential for me than just these wonderful amazing natural products. It was clear to me that there is an opportunity to represent great products along with a company I could really be proud of. Forever's structure is to be exclusive and an independent distributor - being your own boss and running your own business. Something I have thought about for most of my life. I became more and more intrigued with my findings about Forever's organization and I soon found myself enjoying every moment spent in my association with FOREVER and building my own business with them! I was so impressed with the FLP's company structure, training and culture as well as all their resources and services to which they offered and supported. Now, for the people that know me personally, know that I have for the longest time had a passion for natural health alternatives. For many years, I had been an advocate for finding different ways/alternatives to attaining better health and wellness. Some of my personal story is somewhat sad but nonetheless how I learned to value health and well-being and then started my quest for more natural alternatives. Unfortunately, I had a very unhealthy family growing up and I grew up along seeing them constantly in hospitals and taking much medication (we had a basket full of medicine on our kitchen table). Now how sad is that! That lifestyle and environment most definitely had an effect on me! As an adult and in my early twenties, during my first pregnancy, I became even more aware and concerned about my internal body and what I as well as others were putting into our precious systems. I have always enjoyed sharing valuable information with anyone I know and care about (and now with you too) and by also helping people attain and achieve good mental and physical health and true well-being. Here I found a great way of doing just that! 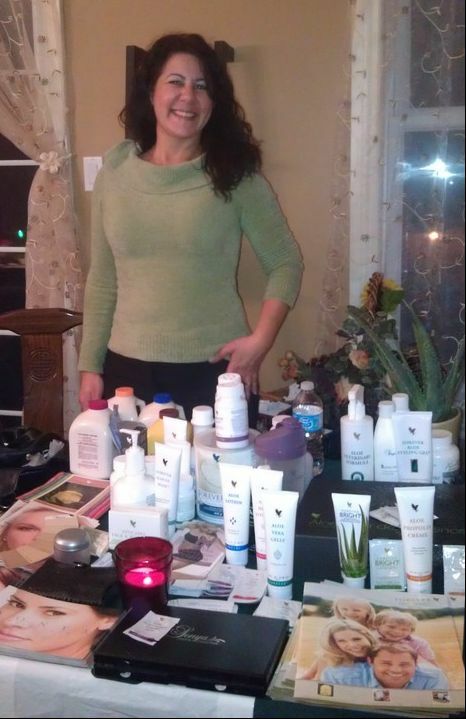 With Aloe Vitality and Forever I found a way of helping people achieve well-being and financial independence too! What a gift to give! Not only could I inform you that these products will help your bodies internal health and ultimate vitality, but I hope to also introduce you to Forever's opportunity. This opportunity offers you the means to assist in your Financial well-being. Only if you so choose ofcourse. What is also so wonderful about this organization is that there is no pressure, no risk and no obligation, just solid quality products and resources! My only intent is to bring you the information and offer you the opportunity for good health, wealth and a lifetime of ultimate vitality! On another personal note, I'm a single mother of two beautiful daughters. Health and finances became much more of an issue in our lives after I separated in 2006 and divorced in 2008. During my marriage, I was a stay at home mom and had only worked part-time for many years within various industries. My professional experience's were in business administration and I had contemplated for years of having my own business. Soon after my separation I realized I needed to change careers to attain my financial independence and decided to work towards self-employment in order to do just that. Knowingly I needed to take better care of my health so to be able to go through the challenge's of these changing life event(s)! Ofcourse I had many obstacles and challenges to overcome. Along with all the new stresses in my life, I knew now more than ever I needed to find a solution to maintain a good physical and mental state. In addition, one of my values is for my girls along with all girls and women is to have strength for their independence so to stand on there own, not relying on anyone but themselves. Ironically, attracting wellness and beauty from the inside out has always been one of my motto's! I strongly believe that a mother's mission is to set a positive example of a real strong, yet loving independent woman and to teach that you could get to wherever you want to go with your will and determination! Never say never and to not let anything stand in your way but never! Basically stay true to yourself by paying close attention to your mind, your body and spirit to which in turn truly does accomplish beauty from within! Aloe Vitality's version of mind, body and spirit...know your potential and really know you can accomplish anything you want to do (if you want it bad enough) and of course attitude is key! So there you have it, this is how my story on how this started with Aloe Vitality and Forever. Funny how this all came together and unfolded! There is a saying, "you are what you create"! With Aloe Vitality I hope to create and provide resources and much vitality for people to learn more about "natural health and their truest well-being", and that I could encourage everyone's life to be full of happiness! My family, friends and I are very fortunate to have found Forever and look forward to a very long lasting relationship. Hope you will find the same fate! Please know that my intentions are to share and benefit from these amazing, wonderful products and to produce my findings with you.